Composer Jeff Toyne’s original score to season one of DirectTV’s Rogue consisting of thirty-four tracks, has been released as an digital album. 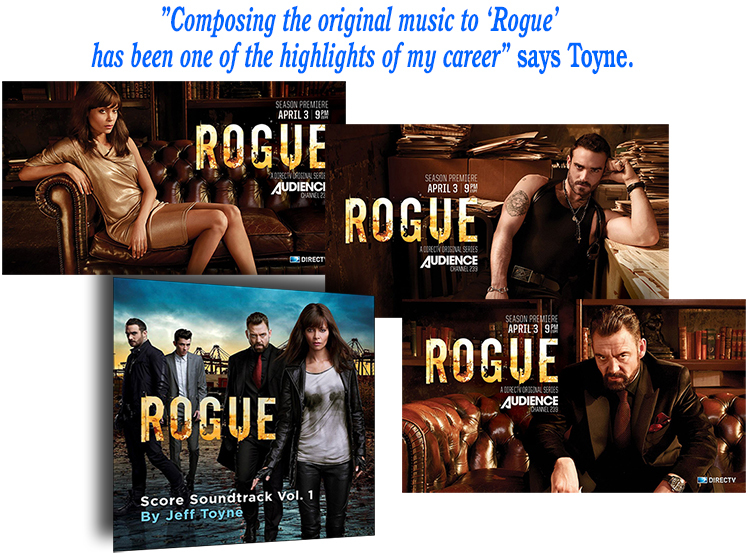 Toyne is currently working on the composition for Rogue season two, set to premiere on May 28. “Composing the original music to ‘Rogue’ has been one of the highlights of my career. The taut storyline, great look, and the fine performances have all inspired my music,” says Toyne. Rogue season two brings a lot of changes to the dark and gritty drama. Grace Travis (Thandie Newton) has moved to San Francisco with her daughter and is now working with the FBI. In this new season, Grace is an FBI handler for a task force investigating corporate espionage. Through her job, Grace comes into contact with Ethan Kelly (Cole Hauser), the head of a security group with a secretive past in the military. Jeff Toyne is a Canadian composer. In his music, Toyne blends orchestral virtuosity with cutting-edge music technology, creating a unique voice for each project. His feature film credits include Abel’s Field (2013), Twist of Faith (2013), Dirty Girl (2011), Blooded (2010, co-written with Ilan Eshkeri), and 10 Years Later (2009). Equally at home in television, Toyne scored several features for Lifetime including Magic Beyond Words: The J.K. Rowling Story (2011), winner of the Canadian Screen Award for Best TV Movie, nominated for Best Score and winner of the MPSE Golden Reel Award. Additionally, Toyne has scored The Devil You Know (Investigation Discovery, 2010-2013). The recipient of numerous awards and distinctions, Toyne was named one of Playback Magazine’s “Ten to Watch” in 2011. He has been commissioned by organizations such as the Canadian Armed Forces, for which he composed “Splendor Sine Occasu”, the Official March of the British Columbia Brigade. In 2007, Toyne was accepted as one of six composers to attend the prestigious Sundance Composers Lab. Rogue is a police drama television series starring Thandie Newton and Marton Csokas. Though set in Oakland, California, the series is filmed in Vancouver. A Canadian-British co-production, the series was co-commissioned by DirecTV's Audience Network, and the Canadian premium services The Movie Network and Movie Central.